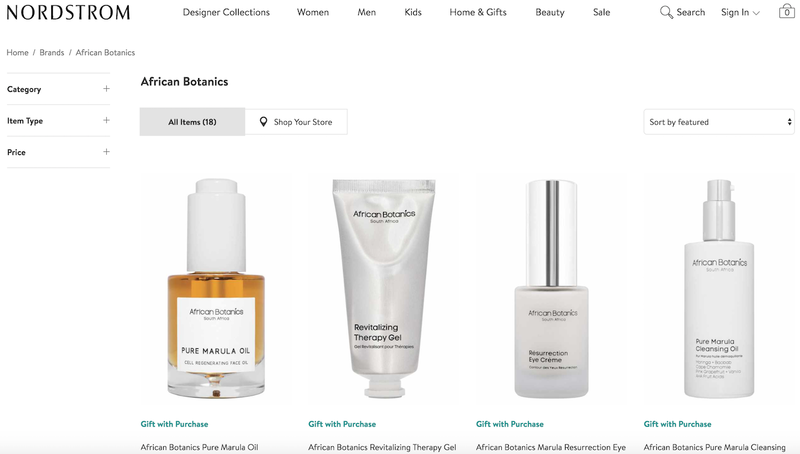 I am so thrilled that Nordstrom now carries African Botanics, and they are currently offering an exclusive African Botanics Gift with Purchase. African Botanics Gift with Purchase: Receive deluxe samples of Marula Mineral Cleansing Mask (0.25 oz.) and Pure Marula Oil (0.17 oz.) with your $150 African Botanics purchase. A $48 value. Gift available online only. One per person, while supply lasts. Will be added automatically in Checkout and shipped to the same address as your order. If associated with a Buy & Pick Up in Store order, gift cannot be picked up and will be shipped to the address of your choice. Gifts cannot be shipped internationally. Past purchases do not apply. If you return the qualifying item(s), please return the gift. I hope that they do too, Allison! You have to try their amazing products! The packaging is so pretty and simple. I'll look at my Nordstrom to see what they have. We all love a gift with purchase!! I agree, their packaging is beautiful! I hope hat they have heir products at your local Nordstrom so that you can try them! I also noticed that the brand was added recently! Probably because I stalk the "New in Beauty" section of Nordstrom, lol! Yes, it's so great that African Botanics is available at Nordstrom! I have been using their products for many years, and it is definitely my favorite brand! AMAZING products! Wow, you've tried it all and I've only seen raves. Great line to be able to get at Nordstrom. It's such an extraordinary brand, and I am thrilled that it just became way more accessible to everyone! Wow you truly love this line since you've reviewed almost every single thing! I really do, their products are amazing! I tried their Marula oil and really liked it! Their Marula Oil is amazing, and their Neroli Infused Marula Oil is one of the very best face oils that I have ever used! You simply can't go wrong with African Botanics, their products are ultra-luxe and first rate!